Global Education Academy is Australia’s only research-based learning centre. We deliver exceptional teaching taught by a team of highly qualified and passionate teachers to help students reach their full potential. This is why we are multi award winners! Here at Global Education Academy, we pride ourselves on delivering exceptional tuition using Cognitive Load Theory, which not only yields great results but sets us apart from every other learning centre for the benefit of our students. We are the epicentre of transformational learning, which happens when research and learning converge to create a positive learning experience. Our goal is for our students to have a learning experience that will shift the way they think and learn. We have developed our own structured learning programs that take the core concepts of the maths and English curricula and present them in a way that reduces cognitive load and facilitates learning.Our students enjoy the interaction and the dynamics of small group environments where they receive individualised attention from our experienced and dedicated teachers who work collaboratively to deliver our programs. Students’ progress is monitored on a weekly basis and an informative diagnostic assessment is held towards the end of every term followed by constructive feedback for the students and a detailed report to the parents. Upcoming national awards on Saturday 6th April 2019, wish us luck! 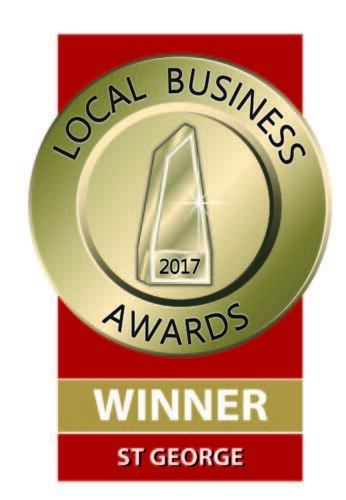 Global Education Academy is now a proud winner of the Australian Small Business Champion Award for best Children’s Educational Services in 2017. We were awarded the prestigious award at the gala dinner and awards ceremony held on Saturday 1st April at the Westin Sydney, which had over 1,000 guests in attendance. 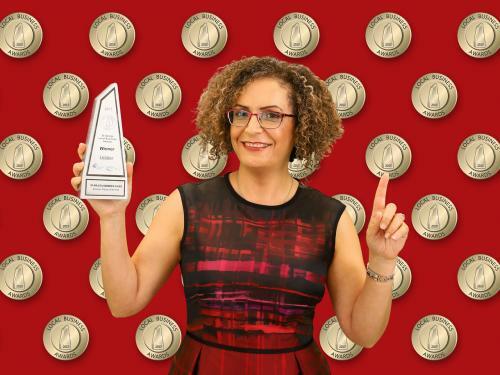 The Australian Small Business Champion Award is the only national recognition program for Australian small businesses and covers a number of business categories. The program aims to recognise outstanding Australian small businesses and encourage high standards of excellence in small business practice. 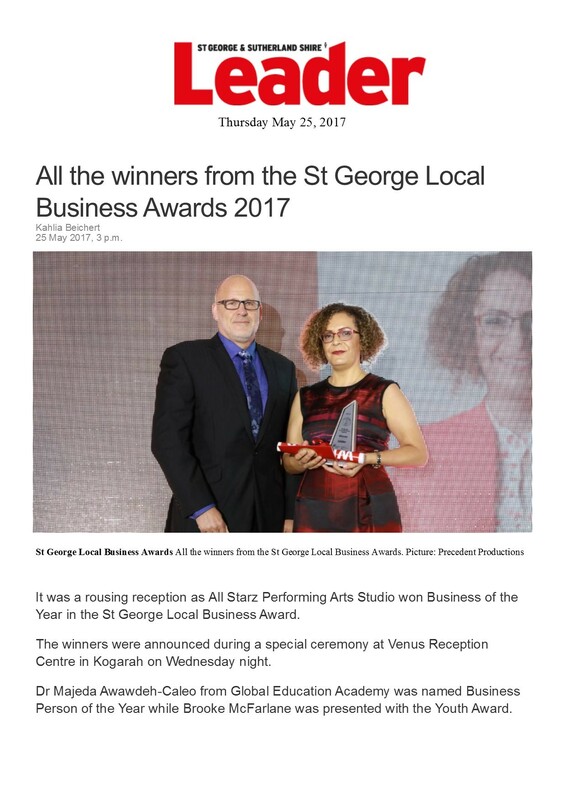 “The Australian Small Business Champion Awards is a way to recognise the efforts of small business people whose efforts contribute to the prosperity and vitality of communities across Australia”, said Steve Loe, Managing Director of Precedent Productions and founder of the awards. Small businesses from across the nation delivered an impressive array of entries, with winners representing a broad range of industries from all states and territories. In the Children’s Educational Services category alone, there were over 14,000 entries. “After I completed my PhD, I was expected to sit in an office and write and publish papers on how to teach for understanding. I refused to do that. I wanted to be the change I wished to see in the world. I started Global Education Academy.” Said Dr Majeda Awawdeh in her acceptance speech. Here at Global Education Academy, we pride ourselves on delivering exceptional tuition using Cognitive Load Theory, which not only yields great results but sets us apart from every other learning centre for the benefit of our students. We are at the epicentre of transformational learning, which happens when research and learning converge to create a positive learning experience. Our goal is for our students to have a learning experience that will shift the way they think and learn. We have developed our own structured learning programs that take the core concepts of the maths and English curricula and present them in a way that reduces cognitive load and facilitates learning. Our students enjoy the interaction and the dynamics of small group environments where they receive individualised attention and our experienced and dedicated teachers work collaboratively to deliver our programs. Students’ progress is monitored on a weekly basis and an informative diagnostic assessment is held towards the end of every term followed by constructive feedback for the students and a detailed report to the parents. Global Education Academy would like to thank its staff, the dedicated teachers and administration team, as well as all its students and their families for accompanying us on this journey so far and we could not be more excited about what the future has in store. “Thank you to all the people who made this possible especially the ones who work behind the scenes. A special thank you goes to our dedicated team of teachers represented by Caroline and David. Our admin and marketing team – Hanady. My assistant manager and daughter Itar who preferred to defer her university degree and work with us full-time when we needed her. Rand who contributed tremendously between her exams with her terrific attention to details. My son Thaer who helped with his financial analytical skills who with his very busy schedule between Deloitte and his Chartered Accountancy degree always managed to find the time to help. And finally, my husband, Mark, who with his business insight, clarity and positivity made this dream come true. As a mathematician at heart, and an educator by profession, I have always wondered why students found mathematics challenging, and why some of them even despised it. It took me over 7 years, and two postgraduate degrees to find the answer; it is the way schools teach the subject. Teaching the process instead of the concept. Teaching the HOW instead of the WHY and teaching to pass the upcoming exam. In my PhD I studied Cognitive Load Theory. Cognitive Load Theory at its core considers the structure of the brain and the working memory of the learner. Then designs instructional material that harnesses mechanics of the human brain for optimal performance and most importantly, understanding. The instructional design and the methodology remove the cognitive load associated with learning, thus making it easier and simpler to understand. I can’t put it into words how proud I was of my sense of achievement when I had finally completed my PhD at the University of New South Wales 2008. I thought in my mind that my thesis and findings will be used to shape how we teach children all over the globe and across all subjects. How wrong I was! I was expected to sit in an office, write papers and publish them and hope that one day someone will read them or use them in their thesis. This is how it works in the academia. I refused to do that. We started Global Education Academy, a research-based learning centre. This is where we teach for understanding. To date, we have supported and guided the educational outcomes of hundreds of students from pre-kindergarten all the way to Year 12. But our mission and objectives are nowhere near complete; our vision is to become a specialised primary school with an emphasis and focus on understanding, and not just assessment results. We have applied to become a school once. We are currently waiting for the site and a little bit of funding – not much just $20 million. I know we will make it and it’s a matter of when, not if. From our humble beginnings in 2011 of three very small room in what used to be a convenience store that was frequented daily by the local school students, to moving to a site that was more than three times the original, and to winning the local small business awards in 2016 and a finalist for 2017 (we were informed only this week), we are realising our dream day by day. Our proudest accomplishment however is the fact that we touched and improved the lives of hundreds of students. Some of them came to us feeling defeated, disengaged and ready to give up, but through the hard work of our staff and our passion, commitment, and vision we have been able to turn their lives around. This child has been attending school for over seven years, and it was obvious from day one that she was not receiving the education she, and all other children, need and deserve. Chloe came to us, as smart as she is, feeling disengaged and scared of maths. She left us with life-long tools she can use to tackle any subject no matter the difficulty. We did that by simply delivering structured, and proven teaching methods coupled with passion and dedication. As most of you know, in Australia you don’t need to complete mathematics in year 11 and 12 in order to graduate high school, enter university and enter the professional workforce. What most of you might not have known however, our standards in maths, science and reading comprehension are sliding dramatically, both nationally and internationally. Some might argue that this is an education funding problem, but I am here to tell you otherwise; it’s an approach to education problem. 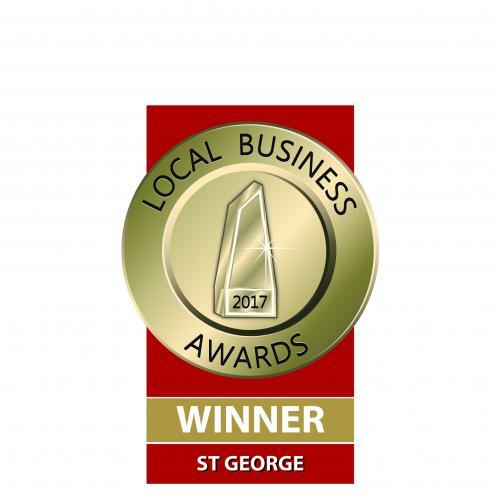 This award recognises an outstanding business person whose vision, influence and dedication shapes a successful local business. Global Education Academy is proud to announce that our founder, Dr Majeda Awawdeh received this prestigious award for 2017. This was the first time she has applied for this award. All the teachers and administration staff at GEA, are proud that her efforts and passion for education have been recognised through this award. “I’ll start with a quote from Tony Robins: “When people know they are going to die or succeed, they tend to succeed.”. Burn your boat if you choose to take the island”. I was 35 when I came to Australia. I know I was born in a country that was too small for my dreams. I needed a continent, so I chose Australia. I came from the other side of the world with three children and zero money. I worked, raised three children by myself and completed a PhD in three years instead of four as my scholarship was running out. I was told by many people that I was crazy. That it is too hard to start again, it is impossible in a new culture, new language and with no family support. I‘ll tell you, it was not a piece of cake, but I never thought it will be. Resources are never the problem. The lack of resourcefulness is. You need passion, you need commitment and you need determination. When you have these three, you can have any resource on earth. So yes, if you are taking the island, burn your boat and you’ll succeed. I am just touching the surface of success with our plans for a second branch, plans for franchising and opening a school. 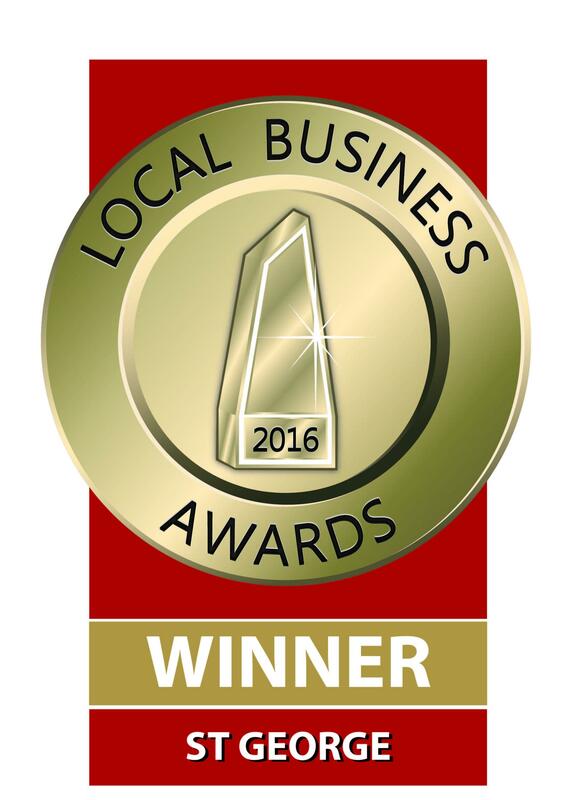 In 2016, Global Education Academy decided to, for the first time, submit our nomination to the Local Business Awards. We won in the category of Outstanding Specialised Business. This result was accomplished through the professionalism, dedication, focus and consistency of our wonderful teaching, writing and administration team of professionals.